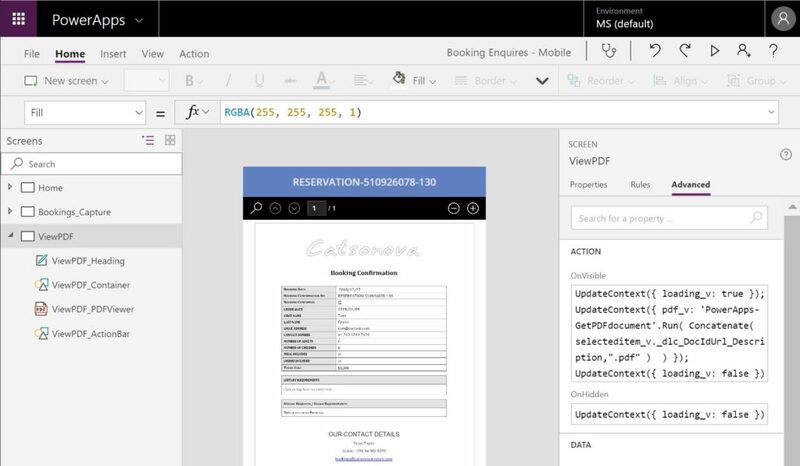 In my previous blog in this series, I showcased a demo app whereby a Booking Enquiry for a cruise could be captured in PowerApps by a user, save that information to a List in SharePoint which in turn triggered a Flow that then automated the process of generating a booking confirmation PDF document and emailed that document to the person who placed the booking enquiry. The person who placed the booking could then print out the booking confirmation PDF document they received and bring that with them the day of their booking. The skipper for the cruise boat could then check exactly what was requested when the booking had been placed, for example the number of people that had been booked on the cruise, meals & drinks included or not etc. That said, the person who placed booking may have forgotten to bring the booking confirmation or perhaps even modified the booking confirmation document they had originally received. Really??? No way ?. Naturally of course in the real world the skipper would unquestionably have all this information printed out the day of the cruise. Thus for the purposes of this blog at least let’s look at a demo of an app that could nonetheless be useful to them and more importantly talk to something many App Makers have been stumped on within your own apps. Namely viewing PDF documents stored in a document library in SharePoint within your apps. Yes, it has been done before! Notable contributions to the PowerApps community that I am aware of and kudos go out to Paul Culmsee and Ryan McComb. So how is this blog then different? I’d like to think that the technique demonstrated in this blog is just about as simple as it can get, short of this functionality become a native feature within PowerApps at least. 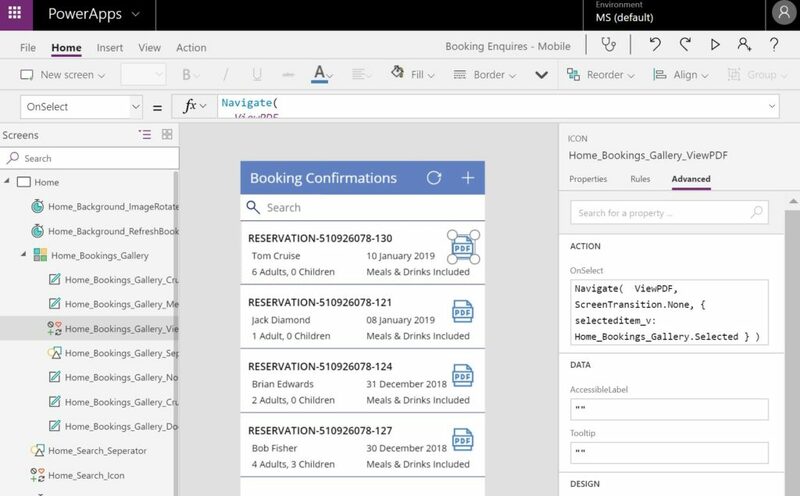 You’ll need to create a Flow that you can instantiate from PowerApps. I started with a blank Flow and added the “PowerApps – Trigger” action to begin with. 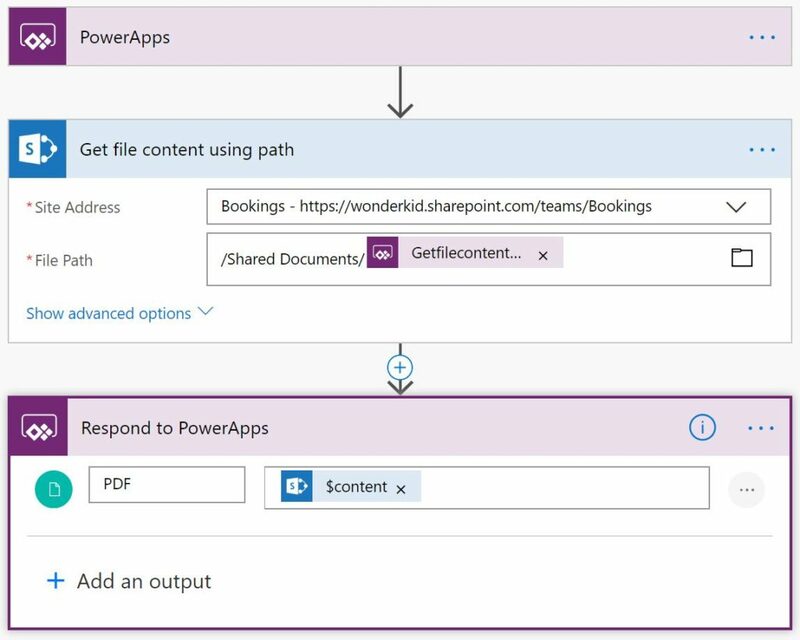 In the file step in the Flow I return the PDF file for the requested document using the “PowerApps – Respond to PowerApps” action. Hang on second (I hear), this doesn’t work…? Actually it does – you simply need to return the right file information the PowerApps PDF Viewer control understands ?. That’s it – we’re now done with the Flow. That simple! 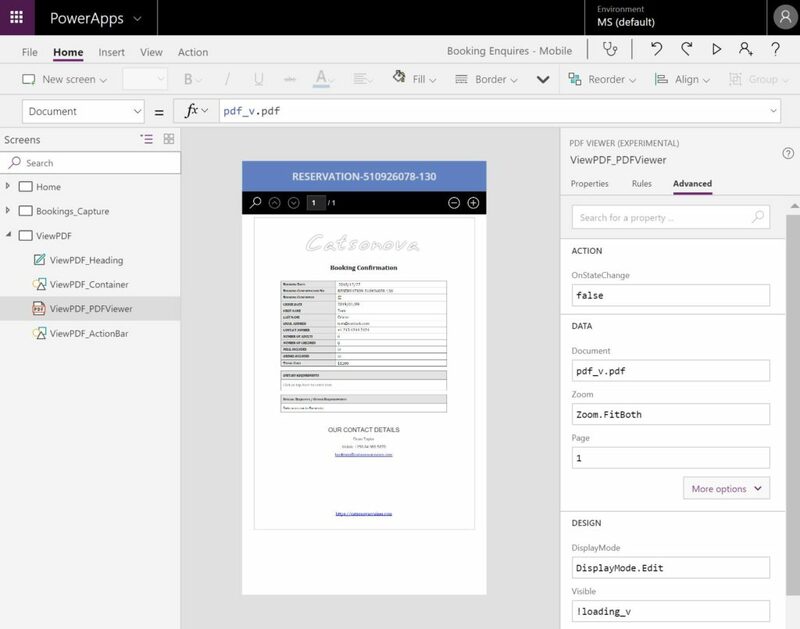 All we need to do now is instantiate the Flow from PowerApps and pass in the name of the PDF document you would like to view in the PDF Viewer Control. In my demo app I’ve added a Gallery control to the Home screen that displays the all the documents in my SharePoint Documents Library. On each row I have an icon that, when clicked, navigates the user to a screen that has a PDF Viewer control, passing the selected item record to the other screen. On the “ViewPDF” screen I have a “PDF Viewer” control to render the PDF document, which I retrieve when the screen is displayed. On the screen’s “On Visible” property I set a variable “loading_v” which hides the PDF Viewer control whilst the Flow then runs to return the PDF content. When the Flow completes I set the “loading_v” property back to false such the PDF is then visible. Per the above snippet, I pass the file name to the Flow and created and use a variable “pdf_v” which will contain the contents of the PDF document returned by the Flow. Finally on the PDF Viewer control, I set the “Document” property to “pdf_v.pdf” and the “Visible” property to “!loading_v“. If it is really this simple, why hasn’t anyone tried this before?? ?